St Dominic, born in 1170, belonged to the noble Guzman family of Caleruega, Spain. After his university studies he became a Canon Regular at the Cathedral of Osma, living a cloistered life dedicated to the public worship of God and personal prayer and study. In 1203, while in France, Dominic, a man of great personal prayer and study, met the Albigensians who believed that spirit not matter was good. To counter this heresy Dominic was inspired to found an order of itinerant preachers. His followers, thoroughly educated and prepared to debate the truth, promoted the dignity and worth of all created things. 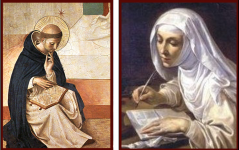 In 1206 Dominic founded a community of women in Prouille, France, to provide a place for women who had responded to his message. From these simple beginnings Dominican women and men are to be found in almost every country of the world. They find hope and joy as members of a wide Dominican family of Friars, Brothers, Contemplative Nuns, Sisters and Laity. By 1929 there were 120 Sisters in Otago and Southland serving a number of Schools and Colleges. Five years later there were two Auckland foundations in Helensville and Northcote. In 1944 a specialised school for the Deaf was opened first in Wellington and then in Feilding. Later again came St Dominic’s Church and Primary School at Blockhouse Bay and St Dominic’s College at Henderson. As part of an Order founded 800 years ago the New Zealand Dominicans have cherished several mottos which express various aspects of their charism. The main motto is Veritas meaning Truth. Our object is …to Praise, to Bless and to Preach the God who loves us all. This mission is enabled by another motto… to contemplate and then share with others the fruits of this contemplation. Today as Dominican women we are continuing to respond to the call of the Gospel, discovering new ways of being involved in the world in the third millennium.